Tread Orthopaedics is a community based, eco-conscious pedorthic practice that offers treatments both in-house and on the road. We will go the extra mile for you. Initial assessments last approximately one hour. We hope clients will leave us not only with less pain, but with greater knowledge to enhance treatment outcomes outside the clinic walls. * On the day of your assessment, please wear loose fitting pants that are able to roll above the knees or shorts. * Tread Orthopaedics uses non-weightbearing Plaster of Paris casting procedure. There is something to be said about a custom, hand made product in an age of mass production. At Tread Orthopaedics, our foot orthoses are hand-crafted and individual shaped pass by pass. Due to the custom nature of this product, production time varies from 2-3 weeks. During this time, clinician Zachary Quesnelle is personally hand-crafting your device from raw materials. Using quality grade orthopaedic materials, our hand-crafted foot orthoses are built to exceed expectations. No device is the same, nor should it be. We offer a range of 6 unique device styles depending on the client's footwear and pathology(s). All modifications and adjustments to foot orthoses are free of charge for the life of the device. We stand by our product. Fun Fact: Orthotics can help reduce symptoms in individuals with ankle, knee, hip and low back pain; not just the feet! Historically speaking, compression stockings, leggings and sleeves were used in instances of vascular insufficiency, lower leg soreness and fatigue in older populations. However, recent research has discovered graduated compression is correlated with reduced leg fatigue across a wide spectrum of society. From business to athletics, compression therapy can be a useful treatment strategy across a variety of circumstances and ages. We are certified in the measurement and fitting of medical grade compression garments. Standard product wait times range from one to two weeks, as compression garments are custom ordered. Tread Orthopaedics offers products from Bauerfiend and Sigvaris. 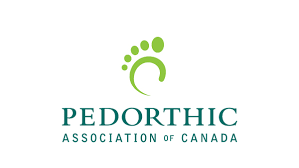 Canadian Certified Pedorthists are educated to view the body from the ground up, believing that the foot is a foundation to all other bodily movements. This highlights the importance that footwear can play in everyday life. A vast majority of society believes foot pain can only be treated by orthotics . This is not the case. We believe that both foot orthoses and footwear equally make up 99% of a treatment plan. "A good orthotic is only as good as the shoe it is placed in"
At this time, Tread Orthopaedics is a small business. We currently do not stock footwear, but we are able to special order from select companies should an abnormal shoe length or width be needed. Companies we deal with directly include Brooks, New Balance, Naot, Asics, Lowa, Aetrex, JB. Goodhue and Pedowell. Tread Orthopaedics offers both custom and off-the-shelf lower limb orthopaedic bracing. Off-the-shelf orthopaedic bracing is an economical way to limit mobility in the instance of recovery or to reintroduce guided mobility in the instance of returning to normal ambulation. The same can be said for custom orthopaedic bracing, used in an ACL or MCL tear for example, but in instances of greater injury. Tread Orthopaedics carries Ossur and DonJoy products, two of the largest orthopaedic bracing companies of today. Due to the custom nature of the product, order duration can range from 3-4 weeks. Follow the link below to view DonJoy and Ossur's product lines and educational videos.